The plan is to sell Hydro One for far more than its book value and use the unlocked additional value to fund a build-out of transit in the Toronto ecosystem. That's the plan as presented for public consumption. The plan might not do much damage to Ontario's electricity sector, but it's not likely to do anything beneficial for transit or provincial finances either. Mostly it's more deceptive spectacle from a government that's been spectacularly inept money managers. This post will primarily discuss two issues: the impact of the sale on the perceived electricity sector debt, and the role of the Ontario Energy Board (OEB) in not only consumer pricing - which it's being claimed it regulates responsibly - but the pricing of the share sale. The plan to sell shares in Hydro One is part of the recommendations in a report from the Premier's Advisory Council on Government Assets. I'll call this the Clark Report as that body is chaired by the architect of Pierre Trudeau's National Energy Plan in the 1980's, Ed Clark - he is also known as a banker. 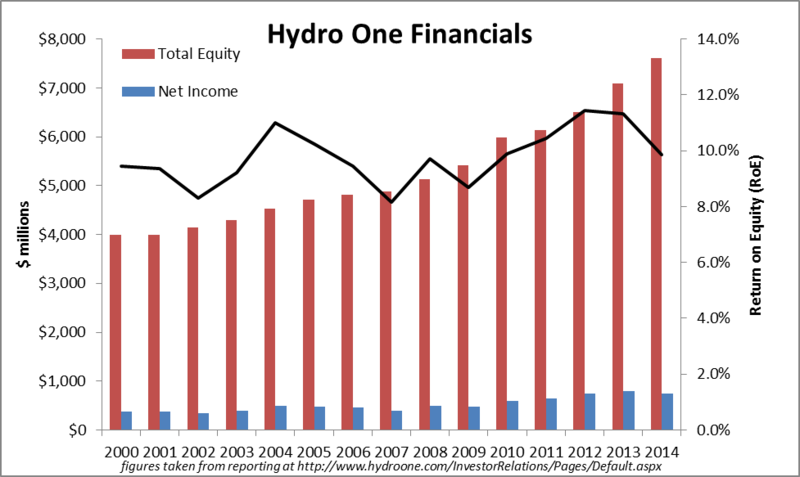 Hydro One's 2014 Financial reporting indicates total equity of $7.6 billion. Call it $15 billion, which is $7.4 billion higher than the total equity reported by Hydro One. $7.4 billion. Remember this number. Firstly, it is the government’s intention to apply the proceeds of the partial divestiture up to the book value of the proportionate share of Hydro One divested in order to pay down debt. This could mean a couple of things but if it meant 60% of the $7.6 billion equity valuation from Hydro One, it would mean $4.6 billion. That might leave, as reported, somewhere around $4 billion for venues for obscure athletic events, etc. When the plan was announced, one quirk I noticed was that it was starkly illegal - not that it should functionally matter to the Premier, who can re-write laws, but there was no consideration given to the fact a starkly illegal use of receipts from the sale was the plan. That has since changed, perhaps for the worse. Some background is necessary to try and keep track of the ball while shells are being moved about. In the beginning there was Ontario Hydro and it was considered good until it wasn't, at which point (1998) it was broken up into 5 successor entities, the most prominent of these were Hydro One (transmission and distribution), Ontario Power Generation (OPG) and the Ontario Electricity Financial Corporation (OEFC). The OEFC is the legal successor to Ontario Hydro. Ontario Hydro's Final Annual Report displayed assets of $39.6 billion, and liabilities of $2.738 billion more of that. After it was broken up a value was put on the successor companies and whatever liability remained resided at the OEFC; the first Annual Report of the OEFC showed assets of $18.979 billion, and liabilities of $19,987 billion more than that - so the unfunded liability got $17.25 billion worse between the end of Ontario Hydro and the start of OEFC. The Electricity Act, 1998 legislated the tools to reduce the initial "stranded debt" - the $19.987 billion liability -and it includes a section, 50.3, dedicating profits from Hydro One, and the proceeds of any asset sale, towards paying down the liability. Much of my previous writing on this focused on a separate revenue tool, the Debt Retirement Charge (DRC), which was intended to pay down debt that profits and payments in lieu of taxes (PIL) alone could not. The amount of the debt the DRC was intended to address is defined as the "residual stranded debt." 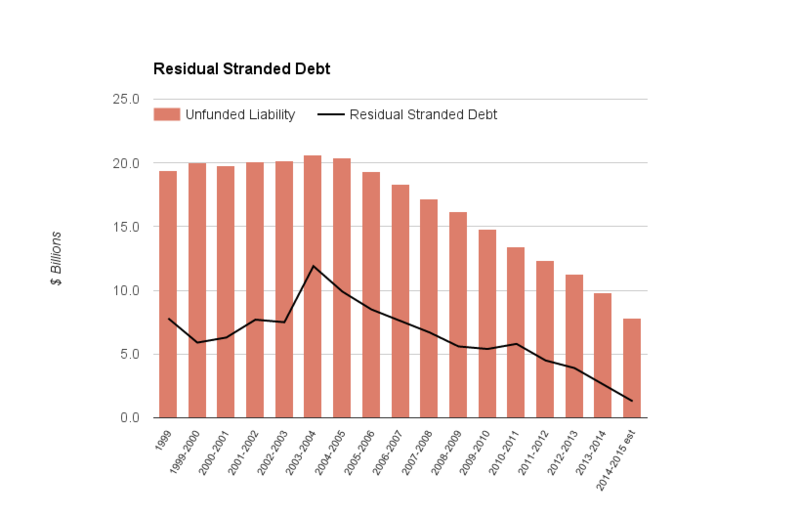 The residual stranded debt determination as at March 31, 2014, is based on a stranded debt amount of $9.8 billion, reduced by the estimated present value of future dedicated revenues to OEFC of $7.2 billion. This results in the calculated $2.6 billion of residual stranded debt as at March 31, 2014. Hydro One and OPG both have fiscal years ending December 31st, while the OEFC fiscal year ends March 31st, but I think it's fair to estimate where the stranded debt would be as of March 31, 2015 based on the combined net income at OPG and Hydro rising over $600 million in 2015 (from 2014) with slightly higher payment-in-lieu of taxes also shown for these entities. $7.8 billion is where I believe the current stranded debt is as of March 31, 2015. $7.4 billion is the figure I asked you to remember from above (expected current market value of Hydro One less the book value). The difference, $0.4 billion, is less than the collection of the Debt Retirement charge for the next 9 months of 2015, and in addition to that there's another year of Hydro One and OPG profits plus the PIL proceeds from the full fiscal 2015-2016. All these prior to any shares being sold in Hydro One. It requires a terrific effort to imply there will be a stranded debt if one is to go by OEFC's books (which are audited by the Auditor General of the province). The current law would see the entire unfunded liability retired over the period of the Hydro One share sales, with some proceeds from the eventual 60% sale still being available to fund cloud machines, or whatever. The government recognizes its commitment to electricity ratepayers under section 50.3 of the Electricity Act, 1998, and is proposing steps to clarify and ensure that the benefits of selling shares in Hydro One are recognized by OEFC to contribute to the continuing reduction of its unfunded liability. Doing so would also help to offset impacts on residual stranded debt from a reduction in the projected present value of future dedicated revenues to OEFC related to Hydro One. Here's why Sousa is babbling like an idiot: the government has already spent close to $5 billion of the profits of Hydro One and OPG since the Liberals came to power in 2003. If you were wondering what $4 billion from Hydro One will contribute to the greater Toronto and Hamilton region, poke your head outside and look about. At some point in 2005-06, the government changed the rules to acknowledge it wouldn't allow the OEFC to recognize any of the sector income until "the Province can recoup all costs associated with its investments in electricity subsidiaries on a cumulative basis." The only appearance of profits from Hydro One, and OPG, on OEFC balance sheets is as "Due from Province of Ontario." A legal opinion CUPE (a union) acquired on the topic felt the requirement to use sale proceeds to pay down debt "terminate when Part V of the Act is repealed." In my opinion, that repeal is to happen when the stranded liability is 0 (from the act, "substantially all the debts and other liabilities of the Financial Corporation have been retired or defeased." That repeal should end the OEFC - remembering it was set up only to handle the unfunded liability of Ontario Hydro. Since its origin the OEFC has become a bank of politically motivated electricity-sector projects. While it might be a little unpleasant to unwind the OEFC, the last I checked the OEFC had no full-time employees, so moving the odds and ends into the Ontario Financing Authority seems achievable. Conceptualizing the government and the OEFC as entirely separate entities, as Hydro One's shares are sold the OEFC would take the government to court for whatever proceeds were required to retire the unfunded liability, and demand all of the "due from Ontario" billions currently on it's balance sheet - then retire to Costa Rica or some such place. The challenge for the government is they would like to spend another $5 billion out of the electricity sector without paying back the $4 or $5 billion they have already spent. To avoid paying back the funds already raided from Hydro One, an honest government needs an unfunded liability to continue to exist. For the outlaw Premier the contradiction isn't likely to appear problematic. Real Valuations, and the Role of the Regulator. The difference between Ontario Hydro's small unfunded liability and the OEFC's large one could be put down to what assets attained under "power at cost" requirements were worth to "for profit" private firms. A company with $32 billion of equipment but no profits is not worth $32 billion. The market valuation has changed from when the long-term cost of capital was 9% (as it was for Ontario Hydro in it's final years) and Return on Equity (RoE) was intended to be 10%, and now when the regulation (OEB) still aims for a 10% RoE but long term capital costs are paltry. This is the regulator the government is claiming sets rates, implying selling Hydro One for nearly twice the book value wouldn't change how rates are set. The Clark Report's "equity valuation of between $13.5 billion and $15 billion" is precisely because a market would not expect a 10% RoE. I suggest it is the laxness of the OEB in protecting consumers that the valuation of Hydro One is nearly double the equity carried on the books. It's difficult to see how the owner's equity doubling, in a share sale, wouldn't demand the OEB raise rates for Hydro One customers towards achieving a 10% RoE. On the other hand, it's hard to see how the OEB could avoid revisiting what an appropriate RoE is on electrical utilities in a low-interest environment, which would demand relieving rate pressures for ratepayers fortunate enough to have avoided being Hydro One's customers. The two points I though necessary to discuss were the impact on the allegedly stranded Ontario Hydro debt and the relationship of the regulator (OEB) to the equity valuation. These are in no way the only two points in the Clark Report that caught my notice. To whom is this clear? Why is a dean of Canadian banking advising on selling an asset that returns a 10% RoE when the debt service charges of the province are not significantly changing? I think that means they see Ontario's weak regulator making Hydro One a cash cow to fund purchases in growing economic regions elsewhere. The OEB's recent report on moving to fixed service charges claimed distributor expense is driven by peak demand and number of customers - metrics that don't promise grow opportunities in most of Ontario. Hydro One should be required to maintain its head office and substantially all of its strategic management functions in Ontario. The Council recognizes that, although the MEUs [municipal electricity utilities] were provided to municipalities at no cost, municipal ownership since that time has, in some cases, added value. Accordingly, the Council believes that the Province should realize value for what was transferred, but that it is unfair to capitalize on the results of stewardship by MEUs over the last 15 years. Just because they were provided at no cost doesn't mean they had no value. My understanding was these MEU's were considered good-faith compensation for costs downloaded from the province. I haven't explored how that contributed to the allegedly stranded liability, but suspect it did so. The "stewardship" spin is just crap, as are the other tax exemption charges mentioned in the MEU section. However, since I argue there is no unfunded liability I can't argue for continued special taxation on the disposition of MEU's intended to support retiring the unfunded liability. 7. The mandate and powers of the Ontario Energy Board should be strengthened to ensure that changes in industry structure do not put upward pressure on rates. The mandate of the OEB should be weakened to solely focus on preventing unnecessary upward pressure on rates - but that has nothing to do with the sale of Hydro One. 11. The Province, Hydro One management, and unions should finalize agreements on pensions and labour costs in advance of the Hydro One IPO to address issues raised by the Leech Report and the Ontario Energy Board with respect to pensions and compensation. They should also sing Kumbaya. 1. Of the assets from the original break-up, a note from the province included $4.8 billion for it's full ownership (all the shares) of Hydro One. This is another number around $5 billion and maybe it's where the government decided it would use $5 billion from the sale of shares in Hydro One to pay off it's initial investment, while using the rest for cancelling power plants, or something like that.